The round circles are the sites that I visited. 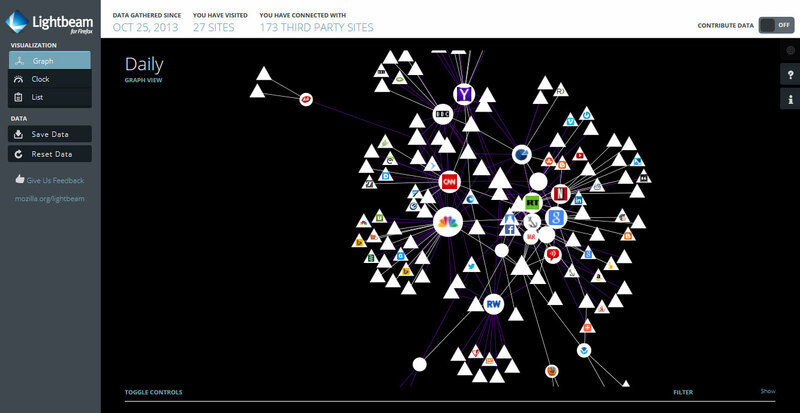 The triangles are third party sites connected to the visited site. During the real Lightbeam session, a mouse over the icon will show the name or url. It is an interesting exercise. Visiting 27 web sites nets a total of 172 third party sites or approximately 6 third party sites per visited site. Commercial news sites like CNN and NBC seem to have the most connections to third party sites. In this case, it appears to be mostly innocuous advertizing. Even so, it is an enlightening experiment.